As you have certainly heard by now, all-day dining is the great new frontier for New York’s chefs. The city has seen, in recent years, the rise of cafés that put equal emphasis on food and atmospheres that feel more like juice bars or coffee shops. Operators squeezed by rising costs and rent have increasingly turned to breakfast to make a few more bucks, giving New Yorkers many more options for morning munching. So where should you eat your eggs these days? 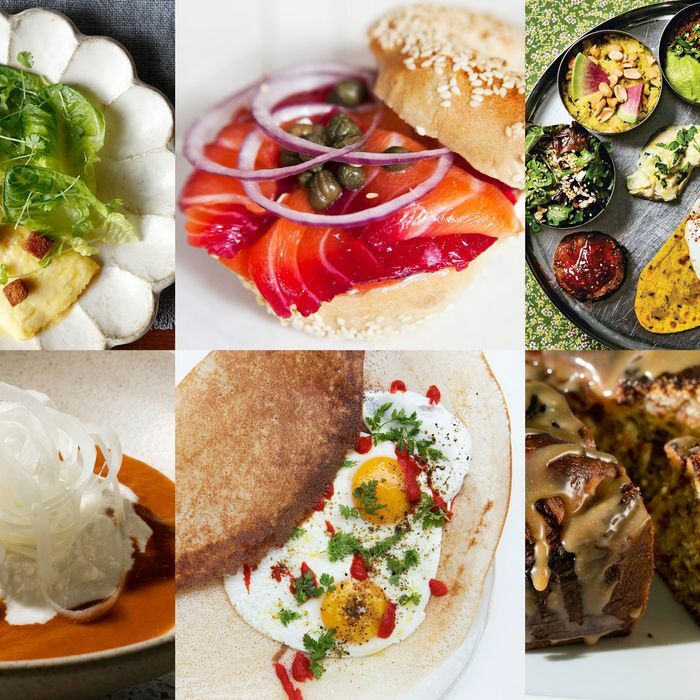 Below, Grub Street’s guide to more than 30 new and notable breakfast destinations that are, at the moment, leading the charge of superlative morning food in New York. The Rundown: A vegetarian and vegan menu, with a wellness glow. This is your place to go for fancy vegetables, and fancy vegetables that will win over even your family and friends who never got over their childhood fear of broccoli. Find restoration, or at least green sustenance, with shakes like the Pollen+ (with “jungle” peanut butter); dosas with Swiss chard, fried egg, and za’atar; and — just let loose! — muffins. The Rundown: Some of the city’s best pastries. Some of the city’s best baking is done at this place in a Tribeca building’s lobby, a great option if breakfast for you means pastries classic (sugar brioche) and creative (speculoos babka) with a coffee. The Rundown: Cosme’s more casual, but still expensive, sibling. Is there a better breakfast than chilaquiles? Many would answer, “No, how dare you even ask!” Grub would only like to add that there are many other good things to eat at Enrique Olvera and Daniela Soto-Innes’s all-day café. Take the chicken enchiladas, the split-pea tlacoyo, and if you had argued for a bagel and lox, the arctic char and farmer-cheese tostada. The Rundown: A classic destination for Jewish breakfast that’s as relevant as ever. Okay, Barney Greengrass is as old-school as it gets in New York. Still, it feels as relevant as ever, is a place that everyone loves (including the late Anthony Bourdain), and provides a proper uptown crash course in the New York breakfast traditions of smoked fish, omelettes, and such. The Rundown: Montreal-style bagels for New Yorkers. The burgeoning chainlet doesn’t celebrate New York’s bageldom; instead, it brought Montreal’s wood-fired, thinner take to town. Still, you can get them pizza-fied, with or without pepperoni; as a classic bacon, egg, and cheese; or with original fillings like ricotta, apple, and honey, or smoked salmon with tobiko cream cheese and butter lettuce. The Rundown: A neighborhood café that’s more than a cut above the rest. C&B belongs to a breed of unassuming nouveau cafés run by pedigreed industry veterans, who have decided they just want to get you caffeinated, maybe make some sausages, and serve things like garlic-yogurt poached eggs and excellent chorizo-and-egg breakfast sandwiches. The Rundown: A diner sans the eggs, bacon, and American cheese. Breakfast, but for people who prefer their bacon to be made from seitan, please. The menu features meat- and cheese-free riffs on morning classics, like a loaded breakfast burrito with tofu scramble, fake chik’n and waffles, biscuits and soysage gravy. The Rundown: For when you need several kinds of breakfast sandwiches. The Rundown: Danny Meyer’s idea of a café. At this takeout annex to Union Square Cafe that’s taken on a life of its own and will soon have a second location, you’ll find everything croissants with cream cheese, breakfast gougères in flavors like green eggs, and four kinds of egg sandwiches. The Rundown: Japanese takes on toast. The Japanese café is compact to say the least, so it keeps its breakfast options limited: a sugar-butter toast set, ogura toast set (sweet red-bean paste and butter), and a pizza toast set. All come with potato salad and boiled egg. The Rundown: When you need doughnuts and a scrambled-egg grilled cheese. Theoretically, you could just eat Wylie Dufresne’s doughnuts for breakfast, if you were so inclined. But, then, you’d miss out on his top-flight scrambled-egg grilled cheese. The Rundown: A cozy space with a particularly good omelette. With its couches and shared tables, Gabriel Stulman’s West Village restaurant is meant to feel like a living room. Which is a nice thing before you start your day, and while you eat your beans on toast or petit omelette. The Rundown: If you need a trip down nostalgia lane. Unabashedly inspired by places like Murray’s Sturgeon Shop, Barney Greengrass, and Russ & Daughters, the owners of this Greenpoint deli want it to be appetizing headquarters for a new generation. There’s a pastrami, egg, and cheese sandwich; a bagel with smoked salmon tartare; and all the essentials. The Rundown: A Noma founder’s Nordic fantasia. The food hall in Grand Central Terminal offers several options for breakfast, like the pastries at Meyers Bageri and parfaits at Almanak. For a sit-down meal, drop into the Bar where you can pick from the havarti morning bun, Danish French toast with cream and cinnamon, and simple eggs your way with bacon. If you’re looking for carbs and then more carbs, you’ve found your spot: There are breakfast sandwiches with malted breakfast sausage or shirred eggs and spiced yogurt, pastries like a sage-buttermilk biscuit, and a toast board with sweet anadama, country olive, and cherry-walnut breads. The Rundown: For all your Malaysian needs. Kopitiam 2.0 is bigger, brighter, and more colorful; the menu has likewise expanded. The Malaysian breakfast is a six-dish mix of toasts, eggs, and soups, with nasi lemak, or coconut rice with fried anchovies; kaya butter toast; and pan mee, hand-pulled noodles with anchovy broth. The Rundown: When you’re feeling French and fancy. An aspirational restaurant in an equally aspirational, just as pricey home-goods store (mercy me, La Mercerie is expensive), this downtown café’s morning menu is all classics: a crêpe complete, with egg, ham, and Comté; warm rice pudding, and brioche with crème anglaise. The Rundown: If you’re still feeling French and fancy. Dinner tables at this pricey French favorite are roughly as rare as ortolan, but so what? You can just go for breakfast and eat poached eggs with saucon choron, clafoutis with blueberries, and gougères in the same spiffy setting? The Rundown: A more casual French option. The Rundown: How they do a.m. meals in Montreal. A full-on Montreal-style deli, with smoked-meat hash, challah French toast, hot dogs in a blanket, and wood-fired bagels (its founder is Black Seed Bagel’s Noah Bernamoff, who recently left the business) like the Cosmo’s creation with beef salami, egg, tomato, lettuce, cheddar, and mayo. The Rundown: Nordic food for Brooklynites. Go to Scandinavia in Greenpoint, and eat havarti and green-apple grilled cheese, heirloom-tomato tartine with fresh cheese, and farro porridge with wild mushrooms. The Rundown: Light, health-conscious, and fish-centric Japanese breakfast. Maybe the most restorative, and arguably the best, breakfast in town is found at Yuji Haraguchi’s first restaurant, where during the day he serves a set breakfast, ichiju sansai, of local fish, brown rice, miso soup, Japanese omelette, pickled or steamed vegetables, and green tea. The Rundown: Indian food, straight out of Houston. Start out your day with the roti wrap called a Frankie with masala eggs and cilantro-chutney, a morning thali, or dosas with smoked eggplant and cheese. Wash it all down with chai served with almond-date milk. The Rundown: A sit-down spinoff of New York’s temple of Jewish breakfast culture. The appetizing store’s spinoff bridges old New York with the new, in a highly stylized, throwback café (staff wear white jackets like soda jerks). The menu is just as much an homage to the sacred traditions of Jewish breakfast, with a whole section of herring, classic dishes like mushroom-barley soup and noodle kugel, and Russ & Daughter originals like the Super Heebster bagel toast. ﻿The Rundown: The city’s strictest, weirdest diner. The great Kenny Shopsin, who passed away this month, was gruff, vulgar, prone to musings, and a great, admired short-order cook. His family will keep his eccentric diner open, and Shopsin’s spirit alive through the quirky, incredibly long menu. The Rundown: New American food with some Middle Eastern touches. One of three Gabe Stulman operations in the Freehand, this restaurant takes the mold of an all-day American restaurant and seasons it with some Middle Eastern spices. There’s an egg sandwich, yes, but it comes on a Jerusalem bagel, and the pastries include Moroccan sfenj doughnuts and bourekas. The Rundown: A brunch destination that also does weekday breakfast. There’s an early window for weekday breakfast before the daily brunch grinds at this Williamsburg restaurant, where you’ll find a few pastries (think a maple-cheddar biscuit) and lighter options, including a chia bowl with oat milk. The Rundown: Dim sum, directly from the source. New York offers a veritable buffet of regional Chinese food, though dim sum has not been this city’s strongest suit. The Hong Kong import shook up the scene when it arrived two years ago, bringing its famous barbecue pork buns (baked, not steamed), pan-fried turnip cakes, and its delicate har gow. The Rundown: Australian-style breakfast, avocados and all. Australians, everyone knows, take their breakfast quite seriously, and have brought their style of all-day café to New York with places like Two Hands. The original on Mott Street is more cramped than the Tribeca spinoff; at both, you’ll find dishes like the very good banana-and-walnut bread, smashed avocado on sourdough, and the brassicas bowl. The Rundown: Vegetarian and California-inspired. A hippie-bowl café with a very California bent, this Soho spot is a downtown option for the meatless crowd. There are waffles made with buckwheat, roasted banana yogurt, and crispy tacos, with onion-pepper-potato hash and American cheese. The Rundown: Gloriously carby, Taiwanese morning eats. Get your grab-and-go Taiwanese breakfast in the Columbus Circle station, where this stall serves ham, egg, and cheese bing; sesame flatbread with scrambled eggs; homemade soy milk; and a couple of other dishes.